Ideas for Trade Shows, Events, Meetings and Expos. Looking for a great idea for your next Trade Show, Event, Meeting or Expo? 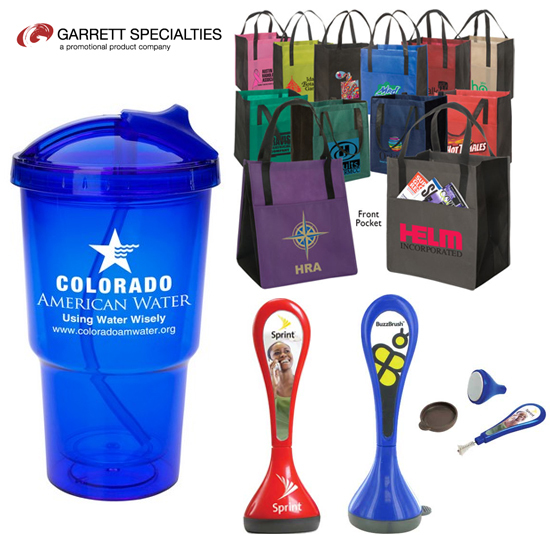 Use business gifts and giveaways to represent your brand. They will help keep the idea of your company in each and every attendee’s mind. Check out these hot promotional ideas. The Tahoe Double Wall Tumbler is a great giveaway. What we love the most about this cup is the bendable straw and snap closure; it keeps the straw tip clean and out of the way. It fits in most cup holders and has a unique dome top shape. The Tahoe Tumbler is the perfect promotion for any industry. Which color is matches your corporate identity. The Metro Enviro-Shopper tote bag comes in several great colors! It has a handy front pocket which is a great place for you to add any printed promotional material. Tote bags are always a hit at events. They always go out like hot cakes. Plus these bags have a huge imprint area for you logo; a great way to keep your logo in view at all times. The BuzzBrush is a cute device for all of your technological devices. This unique gadget cleans your screen and in between keys too. You’ve never seen a screen cleaner quite like this one. Check out the great video below! admin February 04, 2013 Comments Off on Ideas for Trade Shows, Events, Meetings and Expos.